2014 was a good year for paleontology. We saw many new species published, like Changyuraptor, Mercuriceratops, Rhinorex, Dreadnaughtus and Aquilops. We also witnessed discoveries that completely changed the way we look at already-known species such as Deinocheirus or...the beast I'm about to talk to you about right now. Make way (lots of room...back up more...keep going...keep going...backbackbackback) for the mighty Spinosaurus Aegyptiacus! Out of all the discoveries in paleontology made this year, I feel that the new information unearthed about Spinosaurus is the most dramatic. Spinosaurus was a meat-eating dinosaur that lived in what is now Africa, including Egypt and Morocco, during the late Cretaceous Period, about 97 million years ago. It was a massive animal, measuring about forty nine feet long from snout to tail as an adult, making it the largest meat-eating dinosaur known to science. The genus name, Spinosaurus, translates to "Spined lizard/reptile" in reference to the extremely long neural arches on it's back vertebrae. (We have neural arches too, just smaller. If you run your finger down your spine, you can feel them.) Some of these spines were almost six feet tall, giving the animal a very striking profile in life. Life reconstruction of a Spinosaurus aegyptiacus ambush hunting a crocodile while underwater by Christopher DiPiazza. Spinosaurus has one of the richest histories behind its discovery. It was first unearthed back in 1912 and published in 1915 by German Paleontologist, Ernst Stromer. Back then all he had to work with was very fragmented remains including a part of a lower jaw, some vertebrae, and a few ribs, not enough to know for sure what the whole animal looked like, but certainly enough to tell it was something new and exciting. For decades the remains of Spinosaurus remained in a museum in Munich, Germany, on display. During World War II, allied forces bombed the area where this museum was. Luckily some small fossils, including the first discovered Pterodactylus, and arguably the most valuable fossil in the world, Archaeopteryx, were able to be evacuated ahead of time but the poor bones of Spinosaurus were destroyed. For decades the world had no real Spinosaurus fossils to study beyond the photographs and drawings left behind of the originals and small bits and pieces that didn't give any real new information found here and there every so often. In fact, Spinosaurus teeth are actually quite common and are frequently sold in fossil and mineral stores. 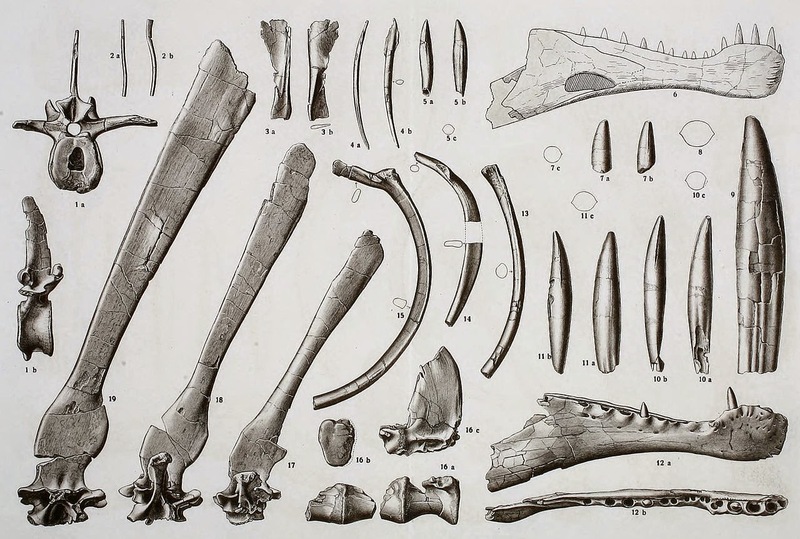 Illustration of the original fossils found of Spinosaurus from Ernst Stromer's 1915 publication. You can see three of the vertebrae with the tall neural arches on the left and the lower jaw piece on the lower right. The straight, cone-shaped teeth are illustrated larger above the jaw. Spinosaurus had many unique features about it that pretty much break all the rules of what we thought we knew about theropod dinosaurs. We will start with the head and work our way back. Spinosaurus belongs to a family of dinosaurs called spinosauridae (named after it, the first known member) which are all characterized by having very long, narrow snouts, similar to that of a crocodile. In these snouts they all had straight, pointed teeth, and their nostrils were not at the tip of the snout, but higher up towards the middle. These characteristics led scientists to believe that spinosaurids were adapted to hunting fish. Their arms were powerful and possessed three fingers on each hand. Digit one of each hand had an enormous, hooked claw on it, much larger than the other two. This was probably another adaptation to hunting since hook-shaped weapons are common adaptations in predatory animals. 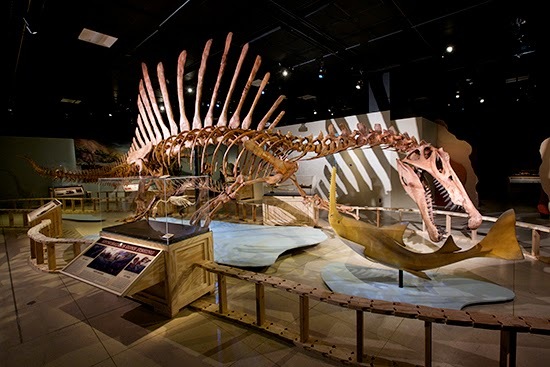 Spinosaurus skeletal mount on display at the National Geographic Museum. As stated before, Spinosaurus had extremely long neural arches on its back that ould have been covered in skin and other living tissue when the dinosaur was alive, giving it a sail-like appearance in life. This is not completely unlike the sail of the also famous mammal-like reptile (and totally not a dinosaur), Dimetrodon, which lived millions of years earlier. Despite the similarities, these two animals are not directly related to each other and is just another beautiful example of convergent evolution. The function of the sail on Spinosaurus is something nobody can quite agree on. There are always those who will say an adaptation like that was for display within the species. Others believe it was to help regulate the animal's body temperature, having possibly been rich in blood vessels in life and easier to heat up in the sun. This is a good hypothesis especially if Spinosaurus was spending a lot of its time near or in the water to hunt. Bodies of water always cool an area down and being in or near it can lower an animal's body temperature to the point where it needs to leave the area to warm up again. Those that don't leave the water have special adaptations to help them stay warmer longer. Think about ducks and geese (which produce their own heat, being endothermic) and how they have a layer down feathers against their bodies. Also think about modern Marine Iguanas (cannot produce their own body heat as ectothermic) and how they can only stay in the ocean for a few minutes at a time until they need to haul out on shore to absorb more warmth from the sun. A good way to experience this is going out on a boat during the summer, it may be hot on the land but trust me, you will want to bring a jacket if you are out on the water for a long while! The sail on Spinosaurus may have been a way for it to increase its surface area to warm itself up in the sun as efficiently as possibly while still being able to hang out in places with lots of water for long periods of time. The shape of Spinosaurus' sail has changed over the years with new discoveries. The newest information about it suggests the sail was somewhat rectangular, with a shallow dip in the middle. Finally we have the legs which is where this dinosaur gets really strange-looking. (That's right. The strangest part is still coming.) For decades nobody really knew what the legs looked like. We just assumed they were the same as those of its close relatives like Suchomimus and Baryonyx, fellow spinosaurids which scientists had more complete skeletons of and were typical for theropods, long and powerful, supporting an obligatory bipedal posture. The discovery that was published this year changed all that, however. According to what was unearthed, Spinosaurus had short legs...like really short legs. So short that it would have had a rough time even standing on two legs. Some scientists have even proposed Spinosaurus may have been a quadroped, possibly walking on its knuckles to keep its claws sharp. (Keep in mind that up to this point all known theropod dinosaurs were obligatory bipeds.) Right after this publication was released many people thought that perhaps the paleontologists suggesting these odd proportions had not considered maybe their new leg material was from a juvenile specimen and was not scaled up to the other already-known material which was from adults. The problem with that argument is that the new leg material was found with other bones that were almost certainly all from the same individual, including some of the long spine vertebrae, which were big just like the other adult-sized material already on the fossil record from Spinosaurus. The mighty Spinosaurus really did have the proportions close to that of a dachshund mythical Asian Dragon! My sketch of how a Spinosaurus may have moved on land. If the tail was heavy enough (and if it was a swimmer with a muscular tail anything like those of modern crocodilans, it may very well have been) it may have been able to pull off bipedal locomotion. The new discoveries didn't end there. Spinosaurus' feet were unique in that the toes were flatter and wider than what is typically seen in theropod dinosaurs, except for certain birds that have webbed toes for paddling like penguins and ducks, suggesting Spinosaurus had webbed toes as well. Spinosaurus' bones were also not hollow like those of most other theropods. Instead they were dense and solid. Penguins are another kind of theropod with solid bones so that they can swim under water more easily. These two amazing discoveries, combined with what we already knew about Spinosaurus' snout and teeth, lead us to believe that this dinosaur was specially adapted for a life in the water. Even having short legs makes more sense. Think of the legs of hippos and otters. These are animals that, although pretty good at getting around on land, really move best when under the water. Also, if Spinosaurus was under the water a lot, having a large sail on its back which may have been more often poking above the surface to soak up some warmth from the sun, it would have been able to help prevent its body from getting too cold. All of these strange adaptations which confused scientists for many years all start to come together a little more with the help of just a few more new (yet strange) discoveries! Spinosaurus running under the water like a boss...or a hippo. I have my doubts if this dinosaur was actually good at swimming, through the water like a crocodile, but walking/running around under it, sure, given its anatomy. Finally, if Spinosaurus was an aquatic dinosaur, it would also make more sense of what we know about its environment. The areas that Spinosaurus bones have been discovered in have a lot of other fossils in them too, most notably lots of other species of meat-eating dinosaur, and also lots of aquatic creatures like fish, turtles, and crocodiles. Before this year, it was assumed that Spinosaurus was so large because it was competing with other predatory dinosaurs, like the slightly smaller allosauroid, called Carcharadontosaurus, and various ceratosaurs. Despite this, it still always seemed strange to have that many predators but not so many plant-eating dinosaurs in the community. 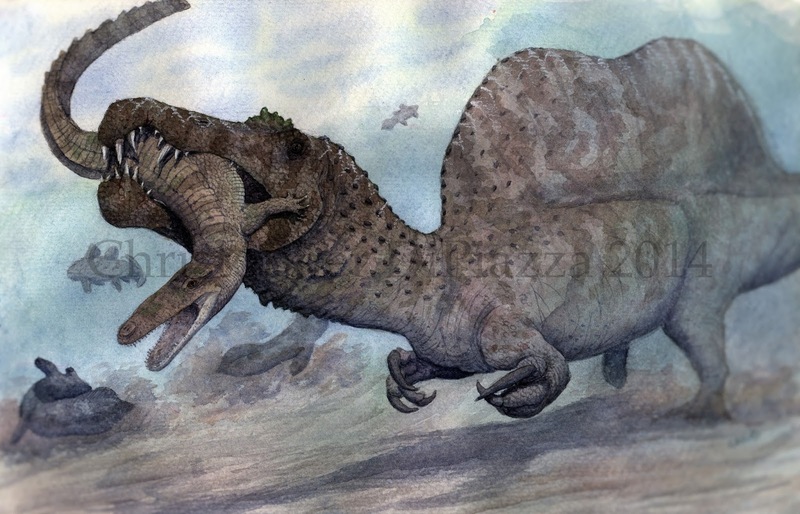 Now we know that Spinosaurus probably evolved in a completely different direction to avoid competition altogether. It was more likely an aquatic predator, spending more of its time in the water hunting fish and other aquatic prey. This way it wasn't occupying the same space, nor was it competing for the same food as its fellow theropods. Since it was the only dinosaur to exploit such a unique niche, it could have evolved to be extremely large without any competition. As you can now see, 2014 was a big year for Spinosaurus. It holds many titles as a dinosaur. Not only was it the largest known meat-eater, it was also the only known non-avian dinosaur to have actually been aquatic. That is all for this week! Join us next year for more Prehistoric Animals of the Week! As always feel free to comment below or on our facebook page. dal Sasso, C.; Maganuco, S.; Buffetaut, E.; Mendez, M.A. (2005). "New information on the skull of the enigmatic theropod Spinosaurus, with remarks on its sizes and affinities". Journal of Vertebrate Paleontology 25 (4): 888–896. doi:10.1671/0272-4634(2005)025[0888:NIOTSO]2.0.CO;2. ISSN 0272-4634. Ibrahim, N.; Sereno, P. C.; Dal Sasso, C.; Maganuco, S.; Fabbri, M.; Martill, D. M.; Zouhri, S.; Myhrvold, N.; Iurino, D. A. (2014). "Semiaquatic adaptations in a giant predatory dinosaur". Science. doi:10.1126/science.1258750. Smith, J.B.; Lamanna, M.C. ; Mayr, H.; and Lacovara, K.J. (2006). "New information regarding the holotype of Spinosaurus aegyptiacus Stromer, 1915". Journal of Paleontology 80 (2): 400–406. doi:10.1666/0022-3360(2006)080[0400:NIRTHO]2.0.CO;2. ISSN 0022-3360. Stromer, E. (1915). "Ergebnisse der Forschungsreisen Prof. E. Stromers in den Wüsten Ägyptens. II. Wirbeltier-Reste der Baharije-Stufe (unterstes Cenoman). 3. Das Original des Theropoden Spinosaurus aegyptiacus nov. gen., nov. spec". Abhandlungen der Königlich Bayerischen Akademie der Wissenschaften, Mathematisch-physikalische Klasse (in German) 28 (3): 1–32. Not exactly the largest since Tyrannosaurus and the large carcharodontosaurids are heavier than the largest Spinosaurus specimen. A 2018 study indicates 6-7 tonnes for the 16 m Spinosaurus, while a 12 m Tyrannosaurus typically reaches and exceeds 8 tonnes. With regards to length, which I specified in this post, Spinosaurus is biggest. Weight and mass estimates fluctuate since soft tissue amounts and makeup is debatable on each of these animals. Also, if you read my post on Tyrannosaurus, I acknowledged your point exactly. "Since then several other meat-eating dinosaurs have been discovered that rival or even surpass the tyrant king in length, but Tyrannosaurus was still the most robust and massive of all of them"